Are your New Years Resolutions flatlining? / Resolutions already flatlining in the New Year? Resolutions already flatlining in the New Year? New Years resolutions. They seem so far away as January is drawing to a close – if you’ve been too busy to notice today’s the last day – so I wanted to reflect on how are you are doing on your New Years resolutions? If your like about half of all American’s (according to a study on statisticbrain.com) you have set some goals to accomplish in 2014. What were they? To get organized? … save more money? … enjoy life? … help others? So how are you doing with those? The same study claims that only 8% of us are successful in achieving those resolutions. Eight percent – just so you know how much this is – 8% of 2014 is already passed. How would you like to be part of a small percentile that reaches it’s goals and dreams? You’re interested? Do you really think entrepreneurs like Steve Jobs set out to reach mediocre goals? Steve told us: “You need to have a lot of _________________ for what you’re doing, ’cause it’s really hard and any sane person would quit. †” What is he taking about: … organization? … budget setting skills? … weight loss? NO! Passion to reach your goal, love what you do to fulfill your dream. Do you think visionaries like Martin Luther King Jr. set out to dream a medium size dream? Martin said”I have a dream that one day this nation will rise up and ††” ____________________________. Fill in the blank again: … get organized? … save more money? … enjoy life? NO! “Live out the true meaning of it’s creed!” A huge dream, that looked impossible to very many people. How about Thomas Edison? Ya think he set the threshold for trying to invent a lightbulb at 10 tries? 100 tries? 1,000 tries? What was his success rate? You really wanna know? Is your goal for 2014 to loose 5 pounds or to change the world? Is your dream to get your desk organized or to undermine the status quo? If you are not going to set your goals high, nothing will challenge you. Big Dreams bring a chance of spectacular failures, but also incredible achievements. How often to you try? How lofty are you’re goals? 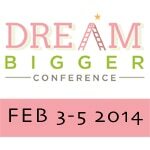 How big are your dreams? If you want to improve you odds to reach new heights in your life (personal or professional) let me challenge you to set higher goals, accept bigger failures and dream bigger dreams. Have you ever tried to dream an unrealistic dream and resolved to make it a reality (if you have tell me in the comments below. If you haven’t tell me what’s stopping you.) Either way you should try it. Believe me the payout is incalculable. † Steve Jobs on passion and loving what your doing: Foundation Initial Goal Setting: Steve Jobs. †† Martin Luther King Junior on his dream: Transcript of "I have a Dream Speech.